When one thinks of Chi Power Training or Qigong, the concept of developingExtra Sensory Perception or ESP becomes a very real possibility…. 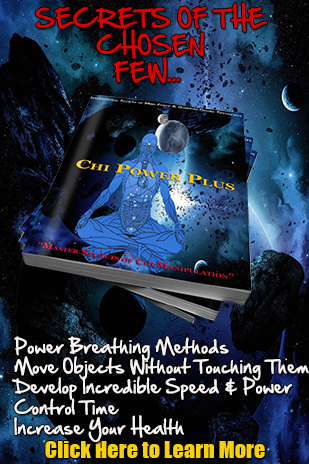 How does a physical exercise like Chi Power Training or Qigong relate to the development of Psychic abilities or ESP? Many have searched far and wide to learn these supposed secret abilities…. These “secrets” are really returning the body back to the way it was when we were younger and had perception…..As we get older, we come to dismiss the abilities we had as children….. The key to doing this is learning how to sensitize the body after it has been de-sensitized after all the years of growing older and allowing your mind and body to conform to what is “normal” and or “abnormal”….. The only “normal” you have is whatever your concept of normal is….It may take a while for you to begin to realize and understand the true capabilities that you truly have and how you can use them, but that doesn’t change the fact that it is what it is….. The simple way to get this to work is to allow yourself to get into a meditative state and get your body to relax, while you instruct the mind and condition the body to “re-sensitize” itself to all available stimuli available….. Sounds easy and simple, but is it really? Well, it is if you know how to do it…….When you have a blueprint that enables you to guide yourself step by step into a new reality, it gives you a power to become more than you could ever have imagined….. The nice thing about this training is that you can go at any pace you want to…..Some train hours every day, while others have a less aggressive routine, one that will assist them to get the results they want in the time frame they want…. The question is……Will you take the next step to allow yourself the chance to get the most out of your mind, body & spirit, and the full potential that is inside of you…. Here is a short list of some of the abilities you can experience….. Crossing of the senses (“seeing” sounds), in which a numinous beauty is revealed or an extrasensory perception is dramatized. Feeling” people in a house though you cannot see or hear them. Feeling that someone is watching you, after which you turn to meet his or her gaze. Feeling a basic compatibility (or incompatibility) with people before you meet them. Correctly guessing the location of water or other materials by extrasensory processes. Spontaneous, unexpected perceptions of distant events. Hearing music or other sounds, for which there is no discoverable physical source, which enlivens particular thoughts or emotions. Correctly sensing the location of lost objects without the help of sensory cues. Opening books to the exact passage you are searching for. Watching someone’s face reveal—as if in slow motion—unsuspected feeling, traits, or possibilities for development. Sensing a numinous presence during meditation, intimate conversation, or other circumstances. Seeing lights around people or inanimate objects for which there are no apparent sources. Looking at something familiar and seeing it as if for the first time. Spontaneously apprehending the presence of someone physically distant or dead, by direct and vivid contact.